Groan! The obtaining of seed trays and starting mix this represents, the fidgety seed-planting, the weeks of indoor watering, the hardening off of seedlings. The setting out of HUNDREDS of baby plants. Am I overdoing it? Lets see: totally empty yard . . . nope, I’m not. Fortunately there will be extras of the vegetable seeds, since our vegetable plot is not very big. I’ve done quite a few starts in a draughty greenhouse, but never this many, and indoor starts are trickier in my experience–probably further complications of the whole hardening-off thing. My thumbs are green enough, but plants do have a way of dying for no discernible reason when you start yanking them up by the root-balls and trundling them around the yard. Consequently I wanted to give myself every advantage by buying top-notch seed grown in my region. Lucky for me I am just outside the Willamette valley and pretty much share that climate. I went further afield for some stuff because I was very clear about what I wanted. The nice part is I won’t have to shell out as much next year, because the flowers are either perennials or will reseed themselves. I won’t have to go to all the garden centers with their scanty selections of seed. I’ll also do some seed-saving, as most of the vegetables I chose are open pollinated. I’m going for a cottage garden with the flowers, so those too, if they’re too picky to grow right from the dirt next spring. If you like heirloom-style blooms, let me save you the comparison shopping and send you straight to Renee’s Garden and Select Seeds. Select Seeds is sometimes a little cheaper, but most of the time the difference is negligible. There are other places cheaper still, but Renee’s and Select seem to do the best job of not damaging the seed in shipping, and getting it to you quickly, according to the Garden Watchdog. Select’s interface is a lot easier to use, as you can get a list of their entire stock with pictures on one page. Territorial is great for vegetables tailored to the pacific northwest–especially short season tomatoes–and you can get a discount on larger packages, if you are planting something in bulk. None of my orders took more than a week to arrive. Territorial got them to me in just a few days. 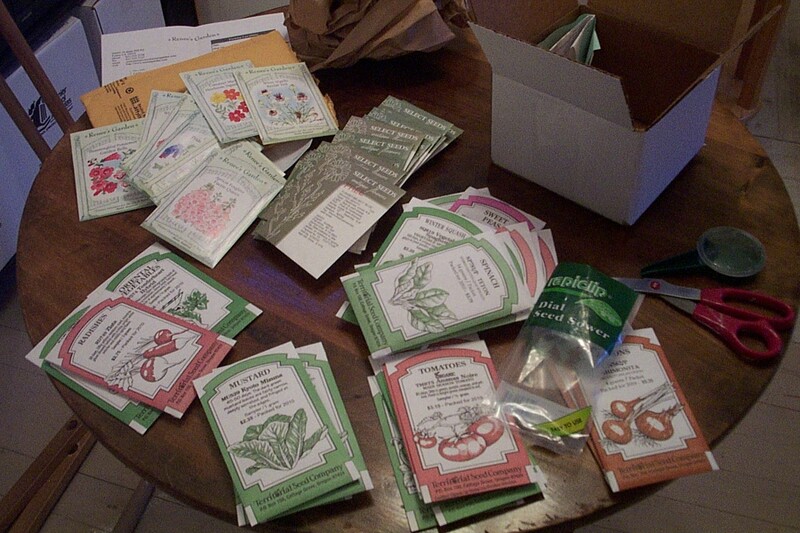 It just goes to show what a coward I am that a big pile of seed packets makes me wring my hands instead of just cheering me up. The truth is that while I love gardens, and think it well worth a lot of work to make one, I am not one of those wholesome people who actually enjoys grubbing in the dirt. I more of a “sit on a cushion, and sew a fine seam, and dine upon strawberries, sugar and cream” kind of gal. By the way, those long pieces of wood you can just see on the left are pieces of my new LeClerc warping reel. They are moldy. I’m annoyed. More later. So far I have spent the year two thousand ten tugged hither and thither by the spectral hands of Ought and Should, and even teeny-tiny Want. Want is like the ghost of a dimly remembered childhood pet. A guinea pig, say. Weaving makes Want unruly. Which may not be a bad thing. But right now I need a linear plan. An order for my disorder of business. Usually this would be a list on a piece of paper. Lists depress me. I keep remaking them, and when I do they only get bigger. I see that nothing is crossed off except the things that jump right back on it again: Laundry. Grocery shopping. Phone difficult relative. Arrange grueling visit to city where difficult relatives live. I was absolutely thrilled when I realized I didn’t need to renew my driver’s license, because I was able to cross it off my list without actually having to do it. Such a feeling of accomplishment! Much more than if I’d actually gone to the DMV. Barring essential chores and a couple of obligatory trips, I have given myself permission to devote the next month-and-half to frivolous things like weaving. I don’t have a paying job. My non-paying job went on hiatus. (We’re talking about four years ago, here.) I took up weaving. My health, which has always been touch-and-go due to a chronic disorder, went to pot and stayed there. I started a weaving blog because I concluded that if I was feeling too poorly to weave much, at least I could make the vintage-loom-specific knowledge I had gained with such difficulty available to new owners of the same sort of loom. Meanwhile, we moved a lot (three times in four years), I sewed a lot of curtains, put a lot of effort into improving my various infirmities without much success, and finally obtained another sort of non-paying job, as renter and renovator of an old house. This was unwise. There was no way of knowing it at the time, but the memory of possible clues still torments me. If there is one thing I’d be happy to accomplish, it’s forgiving my year-ago self for the ongoing f***-up resulting from her decision to enter into the house agreement. The f***-up itself is bad enough. The regret is claustrophobic. Okay then, good place to start! First order of business: Pardon past self for not being able to predict the future, curb the completely spontaneous habit of swearing that developed during your first month working on the house, and refuse to kill yourself working on it this spring and summer. Stop caring whether people think you’re Holding Up Your End. I’ve made an effort at this one over the winter. It’s slow going. I’m a lot like Frederick in The Pirates of Penzance. Duty is my blind spot. I know it makes me really, really dumb about certain things, especially when it concerns my Difficult Relatives, yet I am completely lost as to the extent or the manner, and how to mend it. 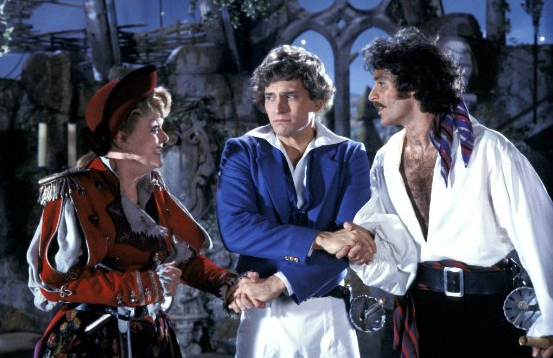 The moral of The Pirates of Penzance is clear: dutiful people end up spending their lives stuck on pirate ships married to old women named Ruth. Second Order of Business: Look online for the seeds on your list so far. Starts are time sensitive. You hate it, but do it. Don’t worry making the list exhaustive, or worry over which starts it would would be better to buy from the nursery. Thinking is the tiring part. Don’t. Just buy some seeds. Third Order of Business: Put away your rigid heddle loom and clear off the junk table. Fabricate the final wooden repair-doohickeys for your hundred pound mistake of a table loom and install them. Put on the heddles. Restring the rods. Draft your pattern. Wind the warp. Warp the loom. Weave. Assess. Fourth Order of Business: Buy good presents for your preschooler nieces, in preparation for your visit. Aunties MUST arrive bearing gifts. This isn’t a duty, but a natural law. Fourth Order of Business: When they come in the mail, try out your cardweaving loom and a hat-knitting loom. Enjoy them. Don’t work too hard at it. Fifth Order of Business: Get a coat. You were wrong when you thought you could get one more winter out of your 6-year-old coat. You look like a WWII refugee! And don’t quibble about the price. You made the last one work for six years, didn’t you? Chances are if a miracle happens and you find another that fits, you will make it last six years, too. Sixth Order of Business: Dust off the Bergman, devise leveling shims to compensate for wavy floors, and beam that big year-old pre-sleyed warp onto the loom. You’ve been tempted to do this before you finish fixing the table loom, because it has been niggling at you from the bottom of the weaving cupboard, but don’t. If the treadling cripples you up and your backup loom isn’t working, you’ll be overwhelmed. It’s not necessary to reconstruct your plans for the warp from your cryptic notes before you beam it. Don’t even count the threads until you’ve got it on the loom.